Businesses succeed when they produce quality products at lower cost and faster time to market than their competitors. Consider a machine that an OEM produces that requires 8 axes of servo motion control. In order to control the machine, the OEM uses a commercial- grade PC and software is written to provide the functionality required. With this traditional approach, you would buy a DSP-based board that can control 8 axes and plug it into the motherboard of the PC (Figure 1). The hardware vendor provides a library, so that the software can make calls to perform the necessary movements. As the machine gets physically built, the 8 servo motors will be installed wherever they are needed on the machine. In some cases, this may be a fair amount of distance away from the PC and other control hardware. Let’s assume for this comparison that the longest distance is 15 feet. After the motors are installed, the amplifiers come next. Since the control interface from the DSP board to an amplifier is typically a +/-10 volt analog signal, a high quality shielded cable must be installed. In addition, the length of this cable must be minimized for noise immunity. This typically results in the amplifiers being mounted fairly close to the PC. Now that the analog signals are in place, it’s time to wire in the encoders. These signals require a high quality cable that runs from each individual motor all the way back to the DSP board in the PC. As you can imagine, the DSP board cabling is starting to get very crowded. 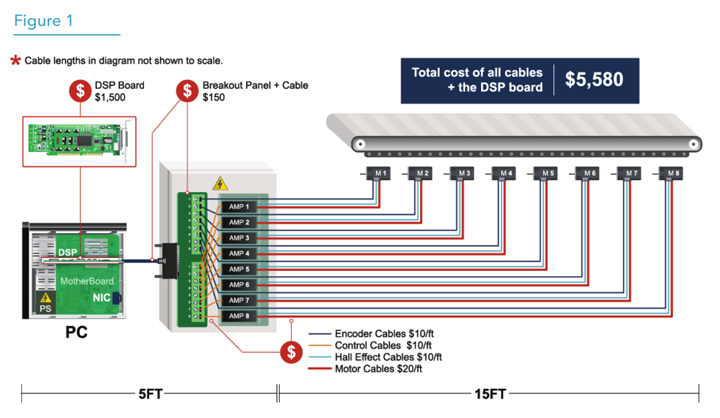 Each cable is about a 1/4 inch in diameter, and there are now 16 cables of that size that are connected to the DSP board. Each cable has to be attached with crimped or soldered pins into a different spot on the DSP board’s connectors, and the shields of each cable have to be tied to a ground pin on the DSP board. A common alternative is to add a fixed cable from the DSP board out to a breakout board. Either way, all of the signals from each of the sixteen cables have to be attached to different connections of the breakout board. This is a very tedious and error prone setup. At this point, we likely have to add cables for the Hall effect sensors. These were not needed when DC Brush type motors were popular, but these days it is far more common to see DC Brushless motors being used that require the Hall effects for commutation. This requires another shielded cable from the motor all the way back to the amplifier. These must be high quality cables as well, as these signals are single ended, unlike the encoder cables which are a differential signal with better noise immunity. With the analog, encoder, and Hall effect signals in place, you now have to wire in the motor power cables. These motor power cables have much higher current than the previous signals, and may carry anywhere from ten to twenty amps. As previously discussed, the amplifiers have been mounted close to the control panel to minimize the distance from the DSP board to the amplifiers. This now means that the cables from the amplifiers out to the motors are now very long. These cables are generally much more expensive, often priced about $20 per foot. That quickly adds up. At this point, the control system is in place, and software can be written to move the motors as needed. A motion control software solution solves many of the challenges inherent in the traditional hardware approach, including vendor lock-in, flexibility, and cost. 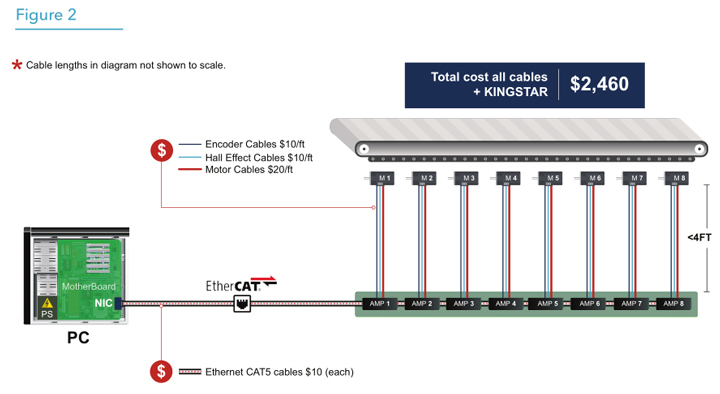 With a software-based motion control solution like KINGSTAR, you can use EtherCAT to transmit and receive data over a network, and use a real-time extension like RTX64 to turn Windows into a real-time control system (Figure 2). Run as an integrated platform, these components can accomplish everything that a DSP solution can provide and more. By using EtherCAT to transmit and receive all of the data over a network, you are able to control as many axes as you need. Scaling up in the axis count is very straightforward as well with the use of standard CAT5 cables, which are inexpensive and available in any length required. With EtherCAT, you can mount the amplifiers very close to the motors. The digital nature of the signals eliminates the analog output cable entirely, as it is just part of an Ethernet packet. This allows the encoder, the halls, and the motor power cables to be as short as possible - a few feet long at the most – which dramatically reduces costs. In addition, all of the cables, now much shorter, are identical. They simply connect a motor to an amplifier. This greatly lowers cost as well, and minimizes the chances of an error. With this system in place, the software can be written. Motion control software delivers equal or better performance than comparable hardware. The Intel processors of today can do the exact same calculations that DSP chips can do. They can calculate motion profiles and perform PID calculations with the very same update rates as the DSP provides. And because the solution is software based, it can be changed very easily. If a more complicated control scheme is needed for a particular axis, you can just program it in. You can leave all of the standard axes to run as they do now, but you can take over control of any axes that require more logic. You can change servo gains on the fly. You can electronically gear any axis to any other. With software, you gain agility, and save time. What happens if you need another axis? With the 8 channel DSP-based board in our example, you have to add another DSP card to add another axis. Not only are you doubling the DSP costs, you may not have another slot in your motherboard to add it. With EtherCAT, you can continue to add as many axes as you need. A single core Intel processor has been used to control 100 axes with an update rate of 500 us. This is an order of magnitude better than the DSP solution. This ability is so powerful that in some cases engineers have looked at equipment as two separate machines. They then realized that they could just combine them into one EtherCAT network where two control programs were running. One PC can control them both, though if needed, they can be given their own separate cores. The software approach also makes it easy to add machine vision to your motion control platform. A software-based vision system simply runs on its own core, and can communicate to the motion control library as needed. Now let’s quantify the difference in cost between the DSP-based solution and the software platform solution. For the DSP-based solution, we need to find the average length of a cable. For the analog cable, we can assume that it is a fixed length of 5 feet from the PC to the amplifiers. For the encoders, the Hall effects, and the motor power, we can say that the shortest cable would be around 4 feet. The farthest axis is 15 feet farther away, so the average axis is 7.5 feet farther away, for a total of 11.5 feet. 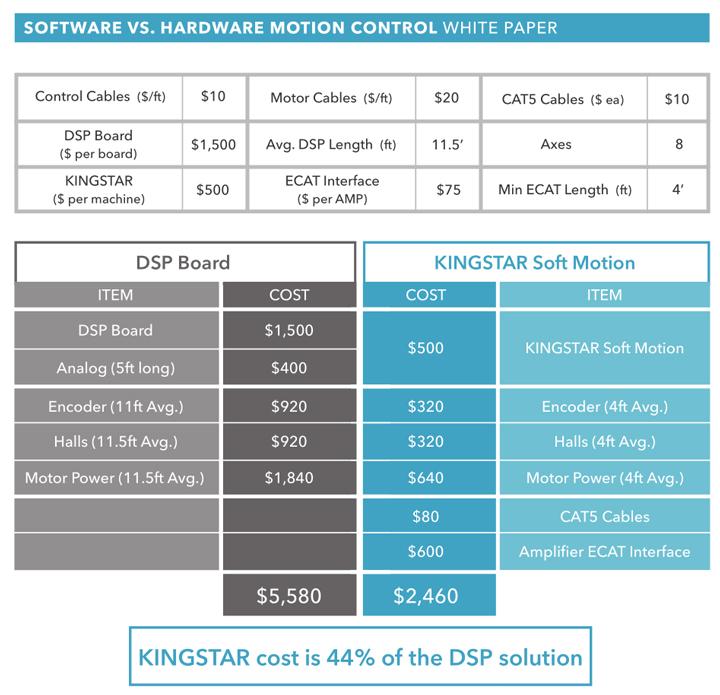 As detailed in the spreadsheet below, for our 8 axis machine, the cost of KINGSTAR Soft Motion is only 44% of the cost of the DSP solution. This number is impressive on its own, but what happens if you need to scale upwards is even more compelling. If you needed to add just one more axis, the DSP solution goes up by $1,500 to add another board to the PC. With KINGSTAR Soft Motion, we can add axes as often as needed at no additional cost. Businesses succeed when they produce quality products at lower cost and faster time to market than their competitors. A software approach to machine control like KINGSTAR enables exactly that. With equal or better performance than traditional hardware solutions at less than half the cost, soft motion control is the clear choice for real business results.